Love precuts? Love Jelly Rolls? Love cutting your stash into 2 1/2″ strips to save for the perfect patterns? FaveQuilts.com just released a new FREE FEE FREE eBook. 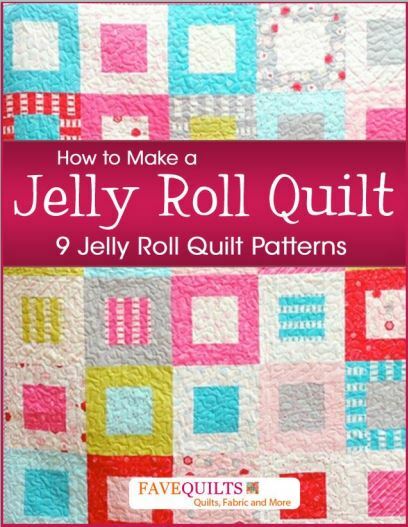 It has 9 different Jelly Roll quilt patterns in there. Since this is a compilation-type book, there are all sorts of styles and designers represented. See one of the most popular ReannaLily Designs Patterns, the Batik Braid Quilt, on page 14. I think my favorite quilt in the book is the Striped Chevrons Baby Quilt Tutorial, page 30. It is a design by Erica Jackman from Kitchen Table Quilting. Click here to be magically transported to the download page. Striped Baby Chevrons looks just precious. I bet it would be just precious in 30’s flour sack prints.